* The Fukushima nuclear plants in earthquake / tsunami-ravaged Japan. * Lindsay Lohan, who seems to be following in the steps of Amy Winehouse. * The Chevy Volt, which tells you everything you need about government-run industries. If Barack Obama ever gets his hands on the airlines, planes would be grounded or falling out of the sky every week and the airline unions would be blaming the lack of a pay raise and improved benefits for it. * Profit-making green energy companies. Of course, if you’re a Barack Obama friend or bundler, don’t worry, you’ll still get your money, but the taxpayers and the shareholders will be fleeced. * Boston Red Sox fans. ‘Nuff said there. * Barack Obama, who started to see the media-created facade of charismatic leader and uniter start slipping away in the face of falling approval numbers, increasing scandal, a moribund economy, an aloofness bordering on abdication of duty, and an increasingly-deadlocked Washington who knows his re-election chances are truly up for grabs. * A Beach Boys fan, who saw (finally!) the release of The SMiLE Sessions, which, while not the final product (something that could never be, as not even Brian Wilson today has a clue as to what SMiLE would have sounded like if he had finished it back in 1967). But tantalizing and mesmorizing in all its complexity, craziness and beauty? Yes! * My sister-in-law Tam, who now has a nice apartment of her own. The world is now officially her oyster; question is, does she grab opportunity by the scruff of its neck and do something with it in 2012? I have my own opinion, let’s see what happens. * Mike “Vegas” Clark and Ben “The Funny Guy” Andrusaits, who emerged from the 21st annual Goodboys Invitational as champions. Of course, you can’t say farewell to a year without doing the same to those whom we loved and lost this year. Rest in peace, Mark and She’s-A-Little-Half-Pint. Devastating losses, both. Finally, before I call it a year, I would like to say to all of you who continue to make Goodboys Nation weblog a part of your regular Internet surfing habit, a big “thank you!” for your continued patronage. I have a feeling 2012 is going to be a rough sled, but hopefully I’ll be here to tell it all as The Great White Shank sees it. To all of you and your families, my best wishes and prayers for the happiest and healthiest of New Years. Maybe a year from now we can all look back and say, “there, there, GWS, that wasn’t so bad, was it?” One can only hope. OK, that’s enough. As is our custom every year at this time we say, take us outta here, George! I know Rob is gonna agree with me on this: for the Atlanta Falcons to complain about Drew Breese running up his passing totals in the last five minutes of last week’s game is a joke. Hey Falcons, if you didn’t want that to happen maybe you ought to have played a better game the first 55 minutes? Jane Leary’s “The Last Boy: Mickey Mantle and the End of America’s Childhood” is a great read. I’d like to get her book on Sandy Koufax one of these days, hear that’s great as well. A tip o’ the hat to GM Ben Cherington of the Red Sox. I think he’s done a great job so far this off-season doing the kinds of things that will help Sox fans forget about the “Great Collapse of 2011”. Until I heard the news of the Sox making a deal for the Oakland A’s closer I thought Andrew Bailey was the guy fighting Old Man Potter in “It’s A Wonderful Life”. But with Mark Melancon (aquired from the Astros for the equivalent of a bag of balls) to take Daniel Bard’s place as set-up man and Bailey replacing Jonathan Papelbon as closer, the Sox have two young guns at the back of the bullpen that hopefully will serve them well for several years. With Bard now in the rotation they just need another back of the rotation starter and they should be OK.
Hard to believe we’re just a couple of weeks away from the start of a new PGA Tour season. I’m predicting a couple of wins for Tiger but no majors. Adam Scott wins at Augusta, Bill Haas wins the U.S. Open, Rory McIlroy the British Open, and Luke Donald the PGA. ‘Fess up: how many people actually missed the NBA not having any games played in the months of October and November? I’m no hockey fan for sure, but the Boston Bruins are one popular team in Boston right now. They started off slow defending their Stanley Cup, but have righted the ship and are playing well. Who would have thought at this point last year they would be behind only the Patriots as the most popular team in Beantown right now. The week between Christmas and New Year’s is always a kind of odd time of year. Tracey and I are both working, lots of folks have the week off. This week seems especially odd, given the fact that for the first time in more than two years we have an empty guest bedoom. My sister-in-law’s rabbits “The Beasite Boys” were perpetually in motion and creating all kinds of noise even when Tam wasn’t staying here; now that part of the house is empty and we’ve got more room than we’ve had in years. I’m hoping that taking a few half-days off will enable me to clean the house from top to bottom: with all the activity around here (both inside and out) a rigorous cleaning is definitely in need. With the weather this week not being quite so chilly as it has been the back patio is back open, even if you need a sweater at night. Still, with the pool light on, the backyard lights, the tiki bar and the patio lights, and the tiki torches lit creates quite a festive and tropical-looking atmosphere. Speaking of New Year’s, there are no plans at all for this year, except for Tam actually cooking us dinner on New Year’s Day in her new apartment. If I’m still up anywhere around the strike at midnight it would be a miracle, as I’m still strying to catch up on my rest from the last two crazy weeks. Which is OK – I don’t have much hope for a lot of good things to happen in 2012, so to be around to welcome it in seems to me to be a pointless exercise, anyways. It’ll come whether I’m awake or not! In a few days you’ll hear George Harrison sing some of Tennyson’s words and sentiments. Christmas is in the rear-view mirror, my sister-in-law and her rabbits are completely moved out, and I’m in an aquatic state of mind today. Whatever it takes I’m all for. I mean, it’s the 21st century. Leave the friggin ‘ whales alone. Susan Casey’s The Wave is a great way to pass the time on a 5:06 flight from Massachusetts to Phoenix. It’s a great read. While the water section of “The Elements” illustrates just how oh-so-close, yet how so far away The Beach Boys’ SMiLE album was to release back in early 1967, their SMiLE Sessions CD is an absolute keeper. Previously-unreleased versions of “Surf’s Up”, “Vegetables”, and (surprisingly) “Good Vibrations” are stunning and worth the price of admission alone. I mean, far out, right? Yoko meets the B52s meets Annette Funicello. Still, I love this tune – especially the way she yells “There’s no difference!” repeatedly over the fade-out. Frequent commenter Jana sends word of this cool YouTube video. I’ve always thought Pink Martini to be a great group. Their version of “Do You Hear What I Hear” is a good one. How about this “Mistletoe Martini”? Sounds way too sweet for me… but then again I’m not a martini drinker. Jana can speak to this better. Speaking of Jana and martinis, looking for Tall Blond vodka? You can order it here. I love this Bert Kaempfert Christmas song. The holiday house lights display ain’t all to bad, either. Always enjoyed this Christmas carol, this is played by Loreena McKennitt. Take it from The Great White Shank, you can do a whole lot worse than to own her Christmas CDs To Drive The Cold Winter Away” and “A Midwinter’s Night Dream”. They’re magical. Call me a burned-out, worn out sap, but I’ve always liked this Christmas song from my youth. Not sure how I could have left this song off my Christmas music list a while back. But let’s not give credit where it’s not due: whenever I hear “I Saw Mommy Kissing Santa Claus” by the Jackson 5, or “Wonderful Christmastime” by Paul McCartney my skin crawls. You won’t get a link to them from me! Merry Christmas From The Goodboys! “And it came to pass in those days, that there went out a decree from Caesar Augustus that all the world should be taxed. And this taxing was first made when Cyrenius was governor of Syria. Merry Christmas and the happiest of holiday seasons to everyone from the Goodboys and Goodboys Nation weblog! Is there another holiday filled with so much expectation and wishes seldom realized or fulfilled? The problem with secular Christmas is that, between the traditions, the seasonal music, and the various movies we’re accustomed to watching, we all too often end up disappointed and disillusioned when we realize the kind of Christmas we have in our minds, hopes, and dreams is just not (or no longer) possible: happy families gathered together around a roaring fire popping with chestnuts, the big tree all lit up, piles of colorful presents all over the place, snow falling outside candle-lit windows. Y’know: the works. Me? I used to feel that way but no longer: the “holiday season” no longer brings any heightened sense of expectation or anticipation; to me it’s all just another time of year. Don’t feel bad for me, certainly I don’t. Thanksgiving is just a day when I have to do way too much cooking and preparation. Christmas is just a time with way too much frenzied running around and traffic jams. New Year’s is just a time to stay off the roads to avoid all the drunk drivers. This doesn’t mean there aren’t any pleasures of the senses: the Christmas lights are pretty, the food and drink of the season are pleasant, I enjoy the sounds of Christmas music, and sharing fellowship and a cup of cheer with family and friends (Goodboys and otherwise) is always something to look forward to. But to expect anything beyond that is simply to open yourself up to another year of disappointment and diminished expectation. My sister-in-law especially suffers this time of year. For whatever reason, she wants it all: the happy family all together, the presents, the joy. Instead, her ex-husband is in jail, she’s separated from her children who are spread across Florida and North Carolina, she can’t afford the kind of gifts she wants to buy, and Christmas greetings are texted from one phone to another. And her story is replicated across thousands upon thousands of families – all setting themselves up for another year of disappointment and diminished expectation. See, I don’t worry about this kind of stuff anymore. And you know why? Because the real reason for the season: God, Who made Himself manifest in order to be born, live, suffer, die, and rise from the dead never disappoints. His love for us is there 24/7, no matter what. During this time of year He’s always waiting for us to say enough is enough – why contort ourselves into pretzels trying to meet expectations that are completely unrealistic? I’m not saying ditch the decorations, food, presents, lights, and gatherings with family and friends; all I’m saying is to make the true meaning of the season a more and better excuse to keep it simple, appreciate what you have, and thank God for all of the blessings you have, no matter how basic or simple they are. For our family and extended family especially, this is a tough time of year. My brother Mark’s death casts a shadow across everything, but we still all have so much to be grateful for. Me? 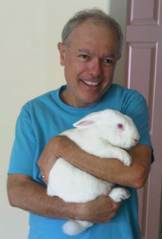 Today I’ll be doing exactly what I don’t want to be doing: running around here and there to ready my sister-in-law for the final move with her rabbits to her new place, getting rabbit supplies, and hitting the supermarket in preparation for Christmas Eve and Christmas Day dinner. Still, there will come a moment when, alone and bathed in lovely window lights and the rest of the house quiet, I’ll think about my family and friends, raise a glass in quiet testament to their love, support, and friendship, and say a quiet prayer to God for the miracle behind what this season is all about. And I won’t feel the slightest sense of disappointment or unfulfilled wishes the slightest bit. Lots of Christmas music around, and like my post the other day I’m hearing tunes I’ve always liked but never knew what they were or who did them. 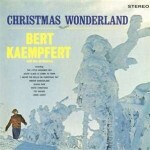 Today I heard an arrangement of “I heard The Bells On Christmas Day” that I’ve heard a number of times since my youth and never knew who did it until it came up on my parents’ Music Choice station and I was pleasantly surprised to see it was by Bert Kaempfert from his Christmas Wonderland” release. I love the picked thunking bass line throughout. Too bad there’s no YouTube video so you can’t hear the whole thing. But trust me, it’s bluesy and good. I’ve always enjoyed Kaempfert’s arrangements ever since hearing his classic “Wonderland By Night” (featuring the same kind of bass line mentioned above, BTW) for the first time. So that’s pretty cool. I liked nearly all the samples from Christmas Wonderland so it looks like that might have to make my Christmas listening list for next year. Happy music for a happy season. Today, this year’s winter solstice, is the darkest day of the year. Even though the earliest sunset is not on the day of the solstice (in fact it is earlier in December), it is the darkest day of the year because it’s the shortest amount of time between sunrise and sunset. This is caused by the Earth’s relation to the sun, as well as the angle of the Earth’s tilt. The amount of sunlight for the solstice varies by region. In New York, for example, there are roughly nine hours and 13 minutes of sunlight for the solstice. In Phoenix, on the other hand, there are nine hours and 57 minutes of sunlight. So Phoenix has 44 more minutes of daylight on the shortest day of the year than New York does. That’s pretty cool. I knew they seemed longer, I just didn’t know how much. I will say this: you can defintely tell the difference up here in Massachusetts from back in the Valley of the Sun. The afternoons are a lot shorter. You know one sign the year is coming to its close? 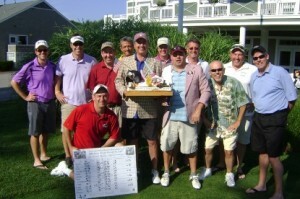 When a few of the Goodboys gather together as we did last night and the talk turned to our February Vegas weekend and where we ought to go for Goodboys Invitational 2012 weekend. To me, that’s always a good sign!